Any business that's trying to increase levels of employee engagement knows that it can take a lot of research, help, ideas, inspiration, etc. to achieve success. Because employee engagement issues are fundamentally human and communication issues, there is no one quick tip or cheap trick to increase employee engagement levels in your organization. 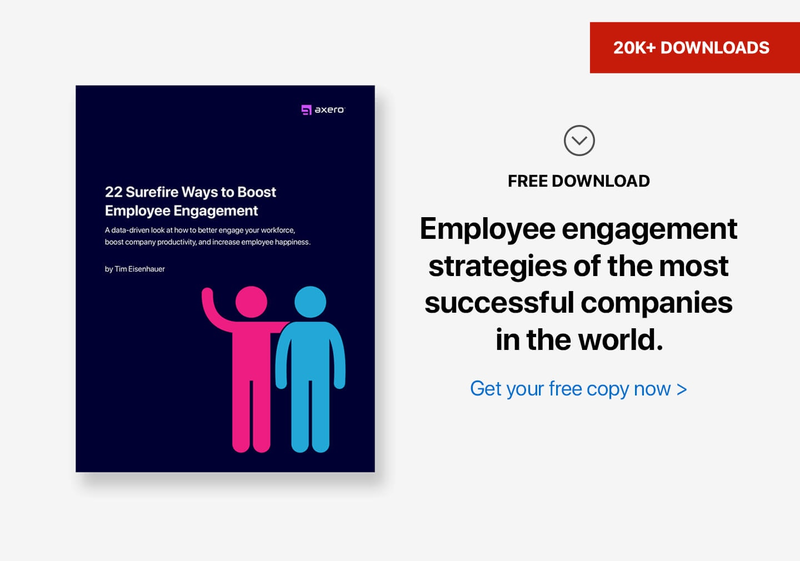 For some employees, engagement can come extremely easy. For others (even those who appear to be engaged), staying focused and on track becomes immensely difficult. Managing a team is no easy task, and the more you can learn about how to improve employee engagement, the better. When setting-out to improve your organization's employee engagement levels, it can be helpful to look at people who have found success in this area. Some of the best CEOs in business history have given their thoughts on the topic, and analyzing them can be extremely valuable for today's CEOs and managers. The following employee engagement quotes can be shared with employees to help them understand just how important engagement is. You can also use them to influence how you manage your team. Analyze what these individuals are truly saying, and you'll no doubt benefit from their knowledge and insight. When you think of brands that have truly "made it" over the years, Campbell's Soup no doubt comes to mind. The soup is everywhere, and the little red and white can has been popularized in all media outlets since it first came to fruition (Andy Warhol famously brought the can to life through his artwork). Chances are that Doug Conant's words have a valuable impact on people. A company such as Campbell's could never have succeeded in the marketplace if things weren't going well within the walls of its own office, which is why this quote still rings true today. The innovation and branding of Campbell's Soup came as a result of having an engaged staff, that put a great deal of effort into bringing the company to the public eye ... and increasing its presence over time. Brands aren't built in a day, but instead over a steady period of time. When employees are engaged within the workplace, it shows in the marketplace. "A great place for great people to do great work." A lot of companies place importance on productivity levels, but what often goes overlooked, is the importance of your work environment. There are many examples today that really show the impact a great work environment can have on the success of a company. Take Google, for example, which provides its employees with a work environment much like an amusement park. This shows that the right environment for high-functioning employees is one that fosters comfort, fun, and — above all else — creativity. Creating a better work environment for your employees is something that can take some time, but you can get started today. Brighten-up the office with new artwork, switch out uncomfortable furniture for something new and comfortable, fill the room with enjoyable music, and do whatever else will make your office more in-line with you and your employee's interests.
" ... they are able to accomplish something collectively that they could not accomplish separately ... "
"A group of people get together and exist as an institution we call a company so they are able to accomplish something collectively that they could not accomplish separately – they make a contribution to society, a phrase which sounds trite but is fundamental." A collective consciousness is important to any organization ... and it can truly make all the difference to the way your business funtions. Collaboration is becoming more and more important as time goes on, and how we collaborate is changing every day. If you're looking to improve collaboration within your organization, try implementing social intranet software with collaboration tools. Using a social intranet helps employees work with each other on a deeper and more collaborative level, especially if you employe remote workers.
" ... no company, small or large, can win over the long run without energized employees ... "
"There are only three measurements that tell you nearly everything you need to know about your organization's overall performance: employee engagement, customer satisfaction, and cash flow. It goes without saying that no company, small or large, can win over the long run without energized employees who believe in the mission and understand how to achieve it." One of the hardest things for CEOs and managers to do is measure their progress. Customers are more important than anything, cash-flow is surely something not to be ignored, and neither of these can happen if your employees are not engaged in their work. Most employees who feel an allegiance to the company want to see positive change. You need employees who truly follow your mission and adhere to your goals. As Jack Welch would surely agree, employee engagement activities and programs are important factors when trying to determine whether or not your business is on the right track.
" ... in looking for people to hire, you look for three qualities: integrity, intelligence, and energy." If anyone in today's world understands money and success, it's Warren Buffett. This quote by Buffett may seem a bit intense, it's definitely true. Employee engagement starts at the hiring process, and it's not always about credentials. When you hire a new team member, it's more important to take their traits and attitude into consideration than it is to focus on their professional achievements. You can train someone to do just about any job, but whether or not they do it well is likely going to depend on their attitude, rather than their actual qualifications. "Appreciate everything your associates do for the business." Of all the above employee engagement quotes, this may be the most important. One of the biggest complaints from modern employees is that they aren't given enough praise for the hard work they do, and as Walton says, there's no reason for this issue to occur. Praise is absolutely free, and the difference it can make can be astounding. Do whatever you can to say "thank you" and to ensure that you're providing your employees with praise for their achievements instead of simply calling them out for mistakes they make. The latter is necessary at times, but there's no way to achieve true balance without the former. Employee engagement is something that is always in flux; and the more you can learn about the topic, the better you'll be at managing your team.